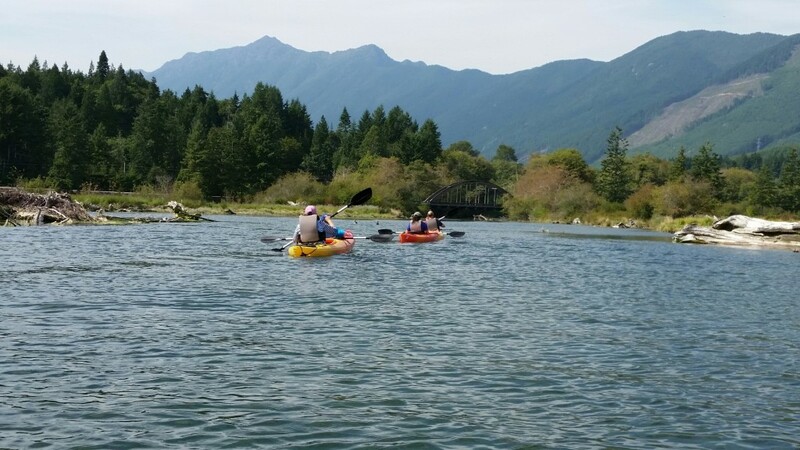 On our 4 hour River & Estuary Tour we paddle to a secluded beach where we will enjoy lunch and oyster shucking before heading up the Duckabush River and back. We will find rocky coves filled with marine invertebrates, and view eagles, harbor seals and a variety of waterfowl in the estuary. Your Marine Biologist Guide will discuss the marine and fresh water environments you’ll travel through, including the natural history of the Hood Canal and the biology of the animals we will see. During crabbing season you can add a kayak crabbing experience to this tour and bring home your own Dungeness and Red Rock crab. If it’s hot we’ll take a swim in the warm waters of the Hood Canal, so don’t forget your suit! We do not supply lunches so please BYO lunch or snacks. If you want to set crab pots during the tour don’t forget your WDFW shellfish license and bait. Please see our Kayak Crabbing page for details. $25 per crab pot if crabbing while on tour. This tour requires working with the tide so please Contact us at least 72 hours in advance to make your reservation. Two person minimum unless we can add you to another group.